. It is a bit of a pain that you have to be standing in the boat to receive the buff. You must be on the boat! 1) How do you get on the boat without flying? 2) It appears that with 7.3, Blizz removed her from the game, as I am at her exact spot but she is no where to be found. It's advisable if the World Quest is up to do it first before joining a group so your group isn't phased. Helps the group keep the buff up. Plus you can't do the world quest while you're in the group so get it done first. Akule Riverhorn is at 41.10, 59.80 on Highmountain Map .. once you get to Tunder Totem your cords change so it will then be 32.4,41.2 I hope this clears up any confusion on the cords. so you may find it easier from Highmountain or Area map. If your fishing raid has one geared DPS willing to do it, we found it to be more efficient to let one person kill the boss when he's spawned. He starts with 17M health and it doubles with each tag. One really geared DPS can wipe him out in a couple of seconds but the more tags he gets, the fight seems to become longer and longer. Something's Fishy buff at the Thunder Totem loication. Drag the macro icons to an action bar. The icons for the tool tips will be the default red question mark until you make your first catch. Then the icon will change to the inventory icon with the count. When you turn in Ancient Totem Fragments or summon Tarn Riverhorn using the Water Totem Figurine, the count will go to zero but the icon will remain. If you're solo fishing when Something's Fishy is up, it's really useful to know whether you've caught a Water Totem Figurine because you can only have one in your inventory at a time. As soon as you catch an Ancient Totem Fragment, the icon (with count) will replace the default icon. If you turn in Ancient Totem Fragments, the icon will remain and the count will go to zero. 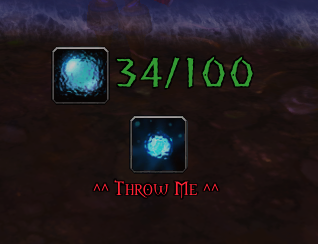 Keep Arcane Lure up to increase your chance of catching bait that attracts rare Highmountain fish. I don't understand. The front page of wowhead says this guy is the fisherfriend for today but I went to his spawn point and he isn't there. A master of the river and the fish within.